There is a koi pond in our new backyard; we didn’t ask for it and it wasn’t what we were looking for. We are in the process of deciding if it is a boon or a curse. A pond is sort of like a swimming pool; it doesn’t add to the value of a property unless it is appreciated by the buyers. 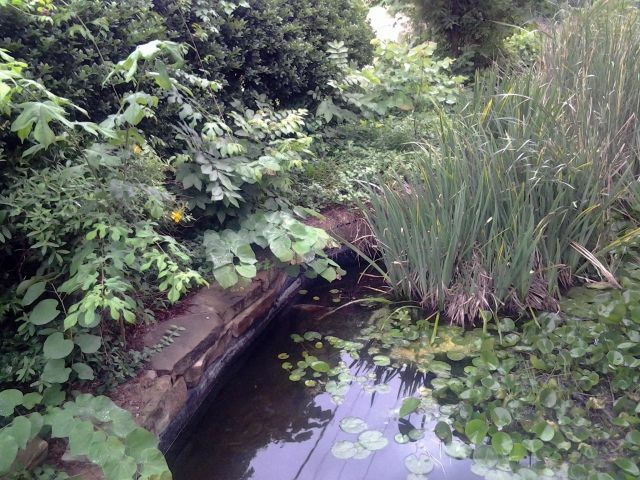 How many people would pay extra for a shallow, high-maintenance goldfish pond full of lilies and cattails? A shallow pond has to have a pump in it to stay pretty. This one pumps a small stream of water to the top of a little rock waterfall. It fills a bathtub-size pool of water, splashes down into a larger one and then finally back into the pond. The effect is amazingly natural, soothing and impressive. We have too many reeds in our waterscape. They are preventing the water from circulating as well as it should for a pretty effect, clear water and a healthy environment for the fish. The green algae builds up on one end and there is mud on the bottom from decomposing vegetation and fish yuck. I watched a YouTube video about how to clean a koi pond. Theirs was only about half as big as ours but two experienced ladies cleaned it in a day. I thought perhaps I could do it with a helper, a small pump, a shop vav and some barrels for the Japanese carp. Because after refilling the pool several times we suspected we might have a leak, I called a pond man out to look at the situation. He said our pump line is too small for good circulation but he could put in a second pump at the far end. We could take a Caribbean cruise for the price he quoted to clean it but it would be done in a few hours. He also thinks we have a leak but he’s confident he can fix it. It is included in the cruise booking. “Fill it up again,” he advised, “and measure the daily drop.” When it stops dropping, we will know where to start looking for holes or tears in the liner. He calculated our pond holds between 5700 and 6000 gallons of water. He gave us a chemical to neutralize the effect of chlorine and we started the garden hose. The pond guy didn’t charge a thing for his expert opinion. The pond filled up in a mere eight hours and we were all set to measure, empty, patch, clean and refill. Then we got the water bill. Years ago I had a 24-foot above-ground swimming pool. I remembered it doubled our water bill when we cleaned and filled it each summer. I thought I was prepared. Our monthly statement said instead of our usual 5000 gallons we metered an extra 9424.8 gallons! What really hurt was that after the first 800 cubic feet, the city charges much more per CCF. I guess we climbed into the industrial usage category to supply filtered, chlorinated drinking water for our goldfish who don’t want or need it. The city also charged extra for sewage treatment of water that we didn’t flush. As it leaks out of the pond, it is watering the cypress tree. I really feel bad now, not only for our pocketbook, but because we’re “wasting” all this water in the midst of a four-year, record-breaking drought. I am wondering if we really want a koi pond, wondering what it would cost to replace it with a little 10’ round splash pool and fountain, wondering if the cypress would survive without it. I am also dreaming about that Caribbean cruise. This entry was posted in Short Takes on Life and tagged chlorinated drinking water, cost of hobby, cypress, drought, high water bill, koi pond, wasted water, water plants. Bookmark the permalink. Personally, I think it is a personal preference and a pondering (sorry for the pun) is imperative. a lot of maintenance, expense, hassle, but only in my humble opinion. Only you know how much joy you will reap. I bet the Cypress would take a lot less water. Decisions, decisions! Thanks for reading & responding. I’ll have to ponder it some, all right, before I tell husband I want to call a contractor to remodel the pond!